BOISE, Idaho — Ronnie Rivers didn’t find many open holes while running the ball for Fresno State in a snowy Mountain West championship game. And he didn’t have one on his final run Saturday night. But it didn’t matter. Rivers took an option pitch and shredded a tackler before scampering into the end zone to give No. 24 Fresno State a 19-16 overtime victory over No. 19 Boise State for the Bulldogs’ first conference title since 2013. His score came after Haden Hoggarth hit a 23-yard field goal on Boise State’s opening possession of overtime. On Sunday, it was announced that Fresno State (11-2) would face Arizona State (7-5) on Dec. 15 in the Las Vegas Bowl. The Sun Devils of the Pac-12 Conference are led by first-year coach Herm Edwards, who left his longtime job as an ESPN analyst to rebuild the program in Tempe. Keying the Sun Devils offense is tailback Eno Benjamin, who has rushed for 1,524 yards and scored 15 touchdowns. With the victory, the Bulldogs moved up six spots in the Associated Press rankings to No. 19. Boise State fell four rungs down the ladder to No. 23. Arizona State isn’t ranked. Fresno State, which was 1-11 two years ago before Tedford arrived to right the ship, has completed its return to college football relevance and restored the program as a Mountain West power. Boise State (10-3) was victimized again on a big stage by its special teams, missing a 42-yard field goal and having an extra point blocked late in the fourth quarter that sent the game to overtime. Fresno State’s Mykal Walker dominated the line of scrimmage with 11 tackles, a sack and a fumble recovery that led to the game’s first touchdown. Jeff Allison and Mike Bell had 12 and 10 tackles respectively for the Bulldogs. “The blue turf thing again?” Tedford asked with a smirk. “I don’t know how many times I have to say it — and the field wasn’t even blue tonight, it was white — it doesn’t matter what color it is, you’re playing a good football team and a well-coached team. 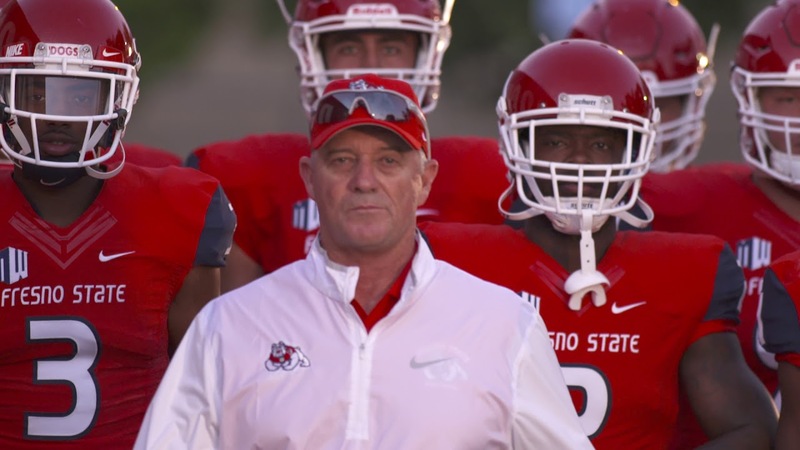 When Tedford arrived at Fresno State — which built a national reputation on former coach Pat Hill’s mantra to play “anybody, anywhere, anytime” — the program was a shell of its former self. Boise State’s seven-game winning streak ended, and both teams’ dreams of crashing the New Year’s Six bowl games died when UCF beat Memphis earlier Saturday to complete a perfect season. McMaryion was 20 of 32 for 170 yards and one touchdown. Mattison rushed for 200 yards and a touchdown on 34 carries for the Boise State. Rypien, the Mountain West Offensive Player of the Year, threw for just 125 yards, completing 15 of 31 passes with one touchdown.